NaamKyun.com is currently preparing a series of interesting books to be published – translations of old articles, books and manuals, research papers, dictionaries, practical tips etc. 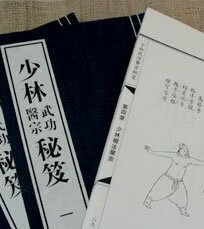 – all dedicated to various Southern Chinese martial arts: Hung Ga Kyun, Wing Cheun, Choi Lei Fat and many other styles and systems. First e-book is scheduled to be launched in the end of 2012. We are currently deciding in which format the e-books will be published, so we would like to ask you, our readers – which format do you prefer? Please vote in our poll! If you do not know, let us know what e-bok reader do you use, if you have another suggestion, please add a comment as well! Our archive of old and rare Chinese articles and manuals is huge, so tell us what topics and arts do you prefer! I wonder why nobody voted “Other, to be exact: FREE e-books”, LMAO. I am changing my vote now!!! What topics do you prefer? Stories? Biographies of famous Masters? Historical research? Training tips? Let us know! My personal favourites among topics are definitely practical training tips and programs followed by interesting (and often inspiring and/or exciting) stories. I like historical research/training tip.